Quick overview Houses of Power is the result of Simon Thurley's thirty years of research, picking through architectural digs, and examining financial accounts, original plans and drawings to reconstruct the great Tudor houses and understand how these monarchs shaped their lives. What was it like to live as a royal Tudor? Why were their residences built as they were and what went on inside their walls? Who slept where and with who? Who chose the furnishings? And what were their passions? The Tudors ruled through the day, throughout the night, in the bath, in bed and in the saddle. Their palaces were genuine power houses - the nerve-centre of military operations, the boardroom for all executive decisions and the core of international politics. 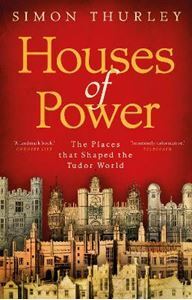 Houses of Power is the result of Simon Thurley's thirty years of research, picking through architectural digs, and examining financial accounts, original plans and drawings to reconstruct the great Tudor houses and understand how these monarchs shaped their lives. Far more than simply an architectural history - a study of private life as well as politics, diplomacy and court - it gives an entirely new and remarkable insight into the Tudor world.